Product prices and availability are accurate as of 2019-04-21 10:25:03 EDT and are subject to change. Any price and availability information displayed on http://www.amazon.com/ at the time of purchase will apply to the purchase of this product. Amla berry, or Amalaki commonly known as "Indian Gooseberry," is a small, greenish fruit with a tart, sour taste. It is a source of whole food Vitamin C and Fiber. One teaspoon of powder provides 42 mg of whole food Vitamin C. Cultivated in India for thousands of years, the fruit has been used in Traditional Ayurvedic Medicine as rejuvenating tonic beneficial for balancing the body and for aiding daily, gentle cleansing and detoxification. It is one of the ingredients in Triphala, Ayurveda's most common herbal formulas. In traditional Ayurveda, Amla is sattvic in nature and is therefore a good general tonic for daily use. 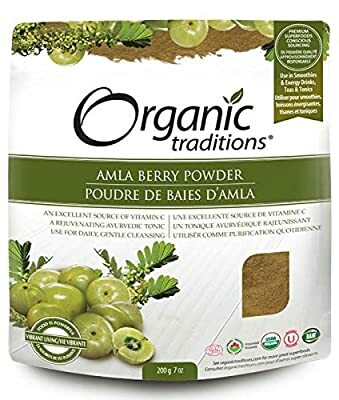 According to the energetic principles of Ayurveda, Amla is sour, sweet, pungent, bitter and astringent in the Rasa taste energy, cooling in action according to Virya and balancing for all doshas, particularly for Pitta constitutions in need of cooling energy. Amla berry powder has a naturally tart, citrus like taste. While it can be used as an everyday tonic, it is particularly beneficial during cold and flu season and in times of stress due to its high content of Vitamin C.